I have known AVON since fetus days. #justkidding I remember curiously flipping through the pages of an Avon catalog as a young girl. I look forward to the perfume section where I could rub my wrist and smell the scent of the perfume they're currently marketing. I would then call my younger brother and tell him to rub his wrists to experience the magic as well. :D My favorite part is the kids section, I would drool over those cute lunch box and bags. But now that I'm all grown up, it's obviously the makeup section that I'm greatly interested in. 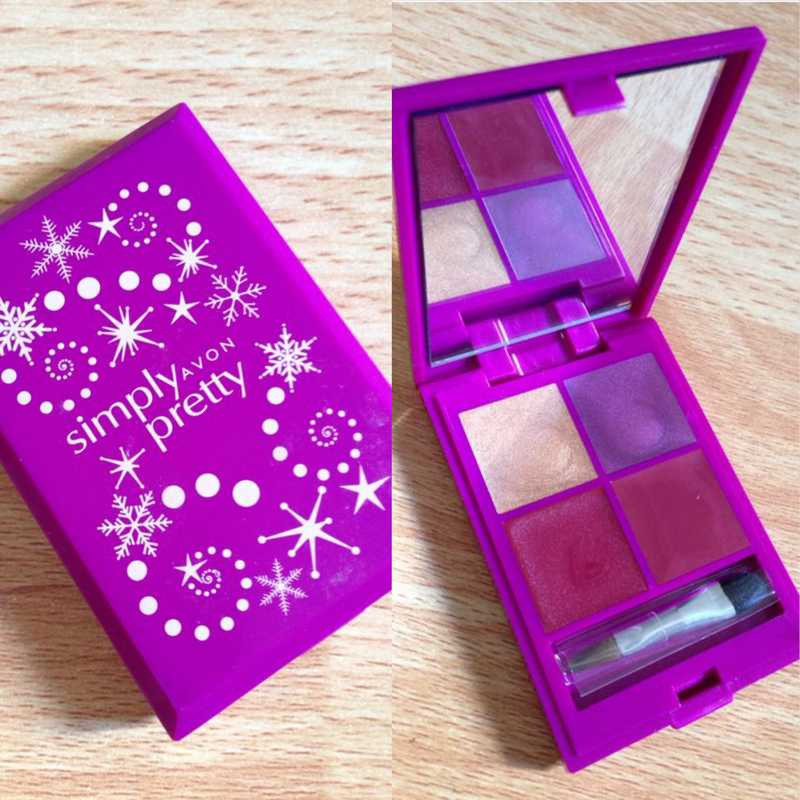 Be party ready and totally pretty this season with the new Simply Pretty Holiday Palette. Contains eyeshadow, blush, and lipstick formula that gives you a complete look for either day or night. Comes in three totally flattering combination that will fit your skin tone. Use the foam tip of the brush to apply eyeshadow and the other end for the lipstick. Use hands for blush formula and just gently pat to blend. The palette comes with 2 eyeshadow shades in gold and orchid, blush in berry, lipstick in mauve silk and a 2 headed applicator: one end for the eyes and the other end for the lips. 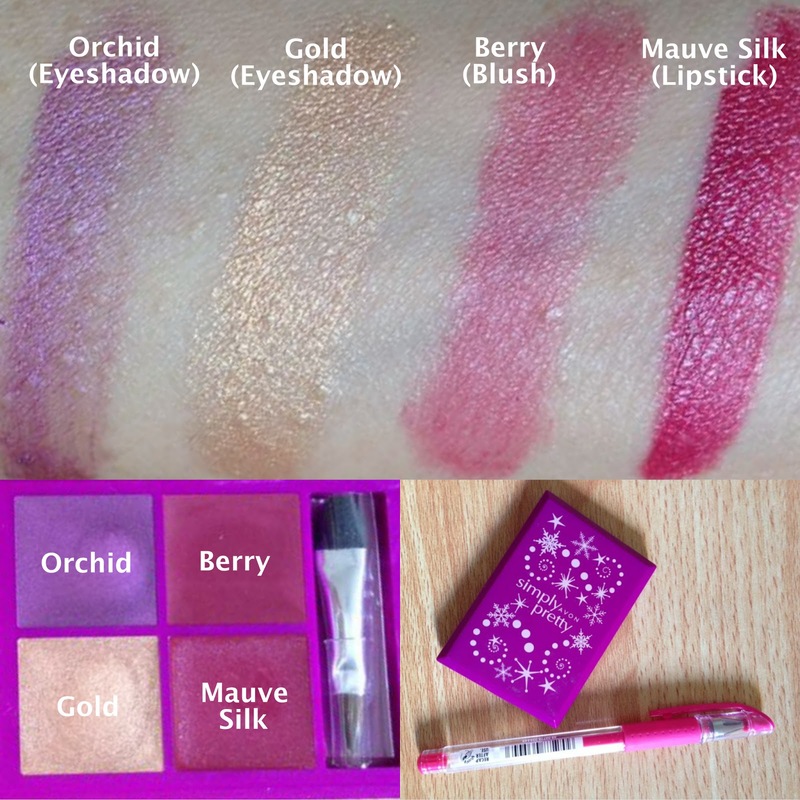 The eyeshadows included in the palette are cream eyeshadows. Here are swatches from the Holiday palette. On the bottom right is a photo showing you how small the palette is. Affordable. Avon is known for selling affordable cosmetics. Travel friendly. The palette easily fits inside my purse. Eyeshadows can also be use as a base. #Tip: After applying the cream eyeshadow, apply a similar eyeshadow shade on top to enhance the color and make it last longer. The blush and the lipstick can be applied interchangeably on the cheeks or lips. When applying the mauve silk lipstick on your cheeks be sure to apply small portions and build it up later since it's very pigmented. 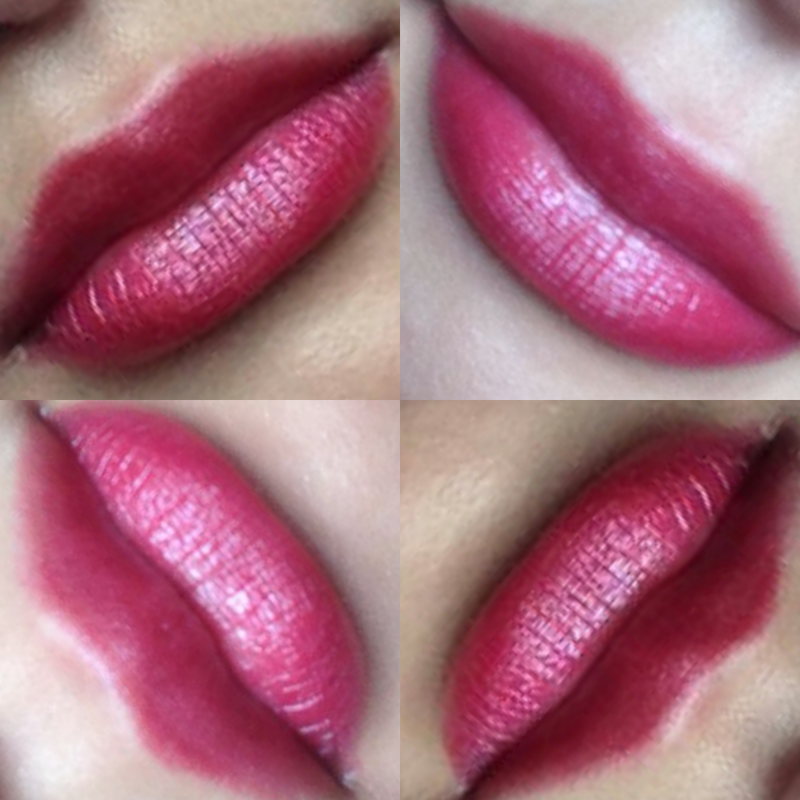 The lipstick included in the palette has a beautiful matte finish that lasts long. Below is how it looks on my lips. The cream eyeshadows in the Holiday palette creases after a few hours of application. Most cream eyeshadows tend to have this creasing problem. #Tip: It's best to set the application with a translucent powder on top or apply an eyeshadow shade with a similar color on top of the cream eyeshadow to prevent the shadows from creasing. If find the berry shade (blush) in the palette on the translucent side. It's almost non-existent. I find the lipstick (Mauve Silk) a bit drying to my lips. I love this palette. This small palette reminds me of Sephora Mini Makeup Palette. It's very economical, handy and affordable. This is great for budget savvy fashionistas out there who are looking for beauty products that actually works but cost less.